Hello everybody and welcome to the Windycitysalmon Newsletter that closes out the 2017 Season. There’s lots of information in this year’s closing letter; a brief summary of 2017, changes in rates and fish cleaning, and some forward looking thoughts of mine. 2017 was a good season by many measures but difficult and frustrating by others. I was excited to get started in April as I made several major investments into most of my electronics, new downriggers, as well as rounding out my rod-spread adjustments with an additional 12 new rods and reels. The season started off the way most seasons begin; good numbers and size for lake and brown trout, which eventually turned to mostly coho salmon by early May. May fishing was very good and June saw solid numbers too. We saw a brief slowdown in early July but it didn’t last long and soon after we were seeing big catches of mixed species; steelhead, king salmon, and still more coho. The biggest fish on the boat was a 24lb king and was the largest king on the boat in a number of years. Plus we had other kings in the 17-22lb range. Those two themes would define the 2017 season; coho that lasted three months and more and larger king salmon than in the past three years. Both trends which will likely continue into 2018. That was the good news. But the bad news is that I had more mechanical issues in one season than probably the past nine seasons combined. And the problems weren’t just relegated to the Independence. Bad juju plagued many of the charter boats in Waukegan in 2017. It was just one of those years. Every captain goes into each season hoping it will be a trouble-free season. And I hoped that more than any season after making the major investments that I did. Most repairs were fairly quick but I found myself out of commission for about five weeks in August and September. Without going into more detail, I’m happy to say that the boat is running well again but it took a long time to diagnose and fix; all the while, the boat sat. The silver lining there is that I learned more about engines than I ever thought possible. Further investments were then made into securing hopefully a more certain future as far as the engines and power are concerned. And I have another list of purchases I would like to make, to replace and improve a few other items. Like every off-season, there are many things on the to-do list as well as reflect on past seasons with ideas and theories for the upcoming years. When I started the business 10 years ago, I felt that I needed something to set me apart from the pack. I decided to make fish cleaning free as part of the charter price. It is indeed the industry standard to charge either $1, or in many cases $2, per fish for fish cleaning. In fact in many other ports around the lake, the captain (or mate) does not take part in the fish cleaning at all. But instead, the customers walk off the boat and take their fish to a cleaning service near the charter dock where the customers pay a subsidiary or separate operation altogether, while the captain (and mate) readies the boat for the next charter. 10 years ago, I needed something (among others) to differentiate myself. Free fish cleaning was one of them. Back then I was also ignorant to the costs that go into the fish cleaning such as all the bags we go through for fish transport as well as the bags for ice, which I make myself all season long. As well the gloves, knives, sharpeners and the boots and apron, which I added into the mix of the fish cleaning operation. Therefore, I decided it is time to change the policy of absolutely free fish cleaning. The new policy is now that if we catch 10 or more fish, each fish cleaned will be a dollar each. If we catch nine or less fish, it is still free. I made this decision with the costs considerations in mind and hope that having me as your captain, sets me enough apart more from other operations, rather than just free fish cleaning. In addition to the changes in fish cleaning, I have moved to a different pricing structure which is based on a per person rate, on a sliding scale. Previously the rates were based on a group of four to six people being the same price, except for the two and three person, weekdays specials, which I will still offer. I decided to move in this direction and away from a legacy and antiquated pricing system. Which is a more simple structure that is easy to quote, read, and figure out without forcing the customer to do the math themselves. Rates will be the same, every day of the week. I will still run two and three person specials from Monday to Thursday and there is a very minimal increase in price there. Four people trips will pay about the same as 2017. There is a minor increase for groups of five and six people. But on a per person basis, is still less per person. The primary reason why five and six people groups now are priced higher than four people is because the boat works harder, longer, and burns more gas for five and six people groups. It works longer for spring-season charters when limits are being regularly taken; of course it takes longer to catch a five and six person limit than it does to catch a four person limit. And works harder under the increased weight load of five and six people. In keeping with my honest and straightforward nature, I wanted to let everyone know of the changes through this communication channel. Everyone who had already booked a charter for 2018, prior to September 12 (when the changes were made on the website) or who had a weather related cancellation on a trip in 2017 booked before Sept 12, and rolled it forward to next season, were grandfathered. I made notes of these charters. Every charter booked after September 12 (and from here forward), fall under the new rate plan. 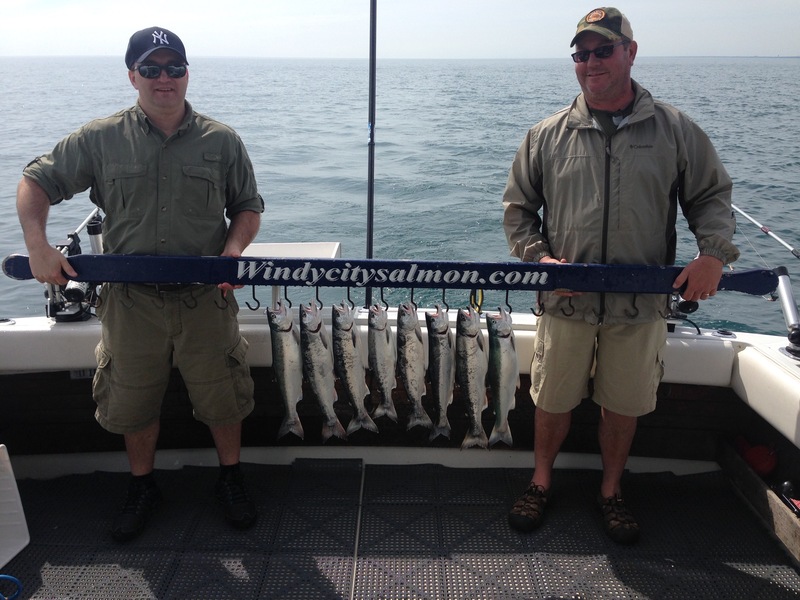 Please go to the website ‘Rates’ page and have look: http://www.windycitysalmon.com/types-of-lake-michigan-salmon-trout-fishing-charters-and-rates/. It is actually better to be seen than explained. You will also see that the new pricing plan is much more simple than the legacy structure of the past and recognizes the extra costs on my end which go into running five and six person charters. Again here, I hope that my honesty and direct approach of informing everyone now, instead of on the boat when we fish, is valued. If you have any question on this matter for your reservations for the 2018 Season, please don’t hesitate to ask. – A return of a normal winter after the previous year’s mild winter. – this definitely did not happen as we experienced a very similar winter last year as the previous year’s. – Many seasons seem to define themselves in terms of catches and abundance of one or more of our five target species. I believe one theme is 2017 will be the year of coho salmon. I believe we will see larger than average coho salmon and good numbers of them could be available throughout spring and into early summer. We should see schools of coho spread out nearshore and offshore. – this was mostly true. However I know at the time that I was thinking that our schools of coho will be found everywhere; both offshore and nearshore. Whereas what actually happened was we had a phenomenal year for coho. But they were mostly offshore again..
– King salmon catches remain challenged however 2017 king catches in numbers and size will be the best than in the past 4 years. – this was true. While numbers still were not great for kings, continued improvement occurred and we saw the biggest kings in several years all over the lake. Several fish over 20lbs came over the rail of the Independence including a 24lb king, our biggest in four years. – Good Lake trout numbers will be available on average when we target them. – this was a pretty general statement and it is indeed generally true. However, hotspots varied and an area that we call the south reef probably saw it’s best lake trout season in quite a few years. Another good lake trout area had it’s days but was not as good as the past two seasons. – After a phenomenal steelhead season in 2016, I believe we will see another very strong steelhead season in 2017 too. I believe this to be the case, based partly on what we see on higher perch populations in recent years. Steelhead often feed on young perch in late summer. – this was not the case. While we still had a very good steelhead season, it didn’t last anywhere near 2016’s very long stretch of time. 2017’s steelhead resembled much more traditional steelhead behavior and patterns. In fact I should not attempt any future steelhead predictions as behaviorally, steelhead are the most unpredictable! 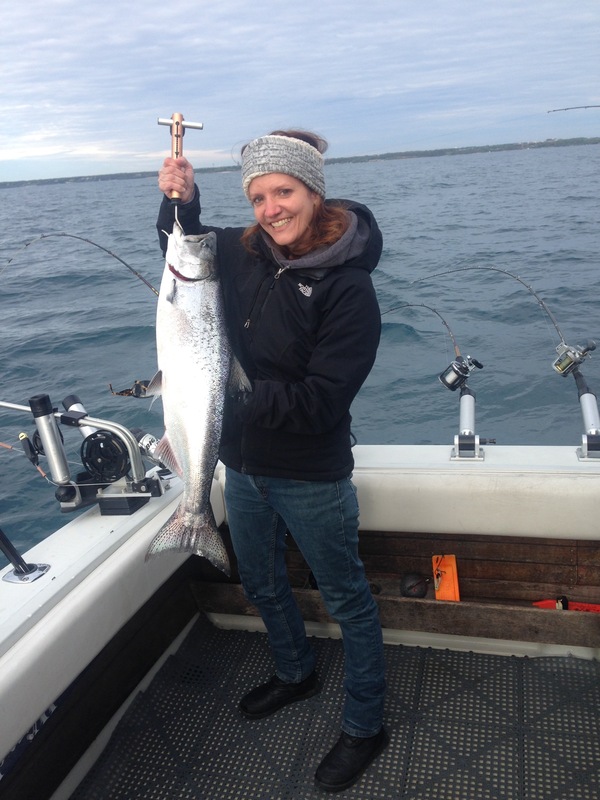 – Coho numbers, size, and catches of them into the summer months will continue to be healthy but not entirely day-to-day. Generally, I am expecting this past season‘s pattern to continue to trend into 2018. – King salmon numbers continue to show incremental improvement; sizes of fish will remain healthy but overall numbers will remain below ‘standard’ catches, pre-2013. Waukegan’s catches of kings will continue to occur more in June and July, rather than in August. In fact some kings could be caught in waters shallower than where our coho will likely be in April, May, and June, if you fish for them. There is sort of a new fishery to take advantage of here, while still recognizing that there aren’t as many kings to be caught in the lake; a new, spring king strategy. – Brown trout numbers near Waukegan, in the traditional areas south of the harbor down to Lake Forest and beyond, continue to trend lower as more lake trout take up residence in what had traditionally been brown trout waters. More browns will be caught, in front of Waukegan and the power plant, near the Wisconsin border, and further north up the shoreline. – Each season we see something that surprises us. 2017’s surprise were king salmon back over 20 and 30lbs. There was even a 41lb king caught out of Muskegan. 2016’s surprises were coho residing way offshore as well as a 6 week steelhead season in the summer. 2015’s surprise was the discovery of huge schools of big lake trout residing in waters just north of Chicago to the south of Waukegan. – Our traditional stretch of brown trout water, south of the harbor, will yield less reliable brown trout fishing but more lake trout in April as well as in the fall; shallow water lake trout are a lot of fun to catch. – We will also hear about large coho being caught in 2018. – We will also hear more about smelt. For the first time in recent years, several of us cleaned a few salmon or trout with smelt inside their stomachs and ports north of us reported seeing smelt schools at their harbors. I’m not suggesting the smelt are back. However a small comeback of sorts seems to have occurred. – At some point in the future, we will look back on skinny jeans on men as ridiculous as we look back on many previous historical fashions. – At some point in the future, we will also look back on holding a phone to the side of our head, as a means to speak and listen, as totally antiquated. In fact, the smartphone as we know it, even though it just seems to have got here, will largely be replaced with other devices; the age of wearables such as watches and glasses will be here soon. Let’s end the letter here by me saying thank you for your business and support. I continue to try to be the five-star offering of charter captains. And while that may not always be in terms of number of fish, every single trip, I hope the conversations we share, condition and quality of my gear and equipment, general cleanliness of the boat, my honesty on how fishing is, and my candid and sincere thoughts on how the weather, wind and waves look for each time we fish, based on the forecast, be reflections on how I believe a top-of-the-line charter captain and charter service should look like. Lastly but lightly, as I dislike giving (and getting) sales pressure, is that each season books up faster and sooner than previous seasons. I’m already booking for 2018, especially for spring time dates. 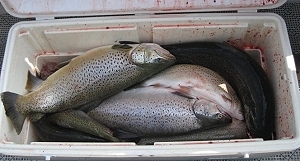 If you are interested in April to June charters, it would be shrewd to start looking at dates soon. In fact not many May weekend slots remain. As always, if you made it this far, thanks for reading and remember that November is International Mustache Awareness Month.